Gino Sarfatti designed this lamp in 1958! This stunningly beautiful suspension lamp has been a classic for the last 50 years. The multi-arm suspension lamp has branching arms that hold frosted ball-shaped lights. 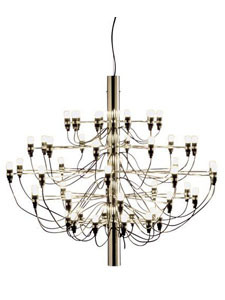 This candelabrum shaped chandelier by Gino Sarfatti is underscored with the fluidity characterized by post-war organic design in the mid to late 1950's. The spiraling and curling of the chromed steel culminating in luminous bulbs is part of the refined aesthetic. Gino Sarfatti's creations in lighting are a fresh and brilliant alternative, even after 50 years. Metal suspension cord, black electrical cord, black steel ceiling rose and fitting. Light bulbs are included. Assembly required.